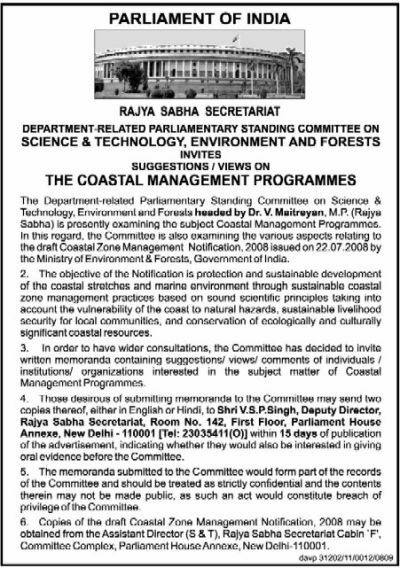 The parliament Standing Committee on Environment has notified in Daily newspapers on 27th November asking interested persons/organizations to submit complaints, opinions, and suggestions on the draft CMZ Notification within 15 days from the date of the advertisement. This is a very important and urgent matter for all of us who are struggling against the draft CMZ notification of the MoEF. Please send 2 copies of your memorandum to the committee by SPEED POST at the address given in the attached advertisement so that it reaches their office before 12th December 2008. Please mention your request for oral evidence too. It is very important. Please contact other groups, co-operative societies, panchayats, and also environment organizations and individuals to send similar memorandum within the 12th December deadline. You may send the materials based on our earlier memorandums to the Ministry of Environment or other materials in critique of the CMZ. Please do it without fail. I am attaching the advertisement with this mail. Please read it and take the address of the Shri V. S. P. Singh, Deputy Director, Rajya Sabha Secretariat given in number 4. This is to bring to your kind attention the deteriorating situation of our fishermen and the fishing industry in general. There are around 600 mechanized boats from Thoothoor area of Kanyakumari District, Tamil Nadu engaging in deep sea fishing with the combination of long lining and gillnets. They go beyond 300 to 400 nautical miles for fishing and the duration per voyage is 30 to 40 days. They operate long lining method for shark fishing and gillnetting for other species in the deep sea. As a part of the diversification in fishing sector many of the fishermen converted their boats in to tuna fishing vessels with the financial assistance of Marine Product Export Development Authority of India (MPEDA). Many more are on the process of converting their boats in to tuna fishing vessels. We wish to inform you that if you expect us to increase the “Indian Capacity for Deep Sea Fishing Operations” support is required for the Indian deep sea fishing boats with suitable schemes which should be introduced based on consultations with our fishermen and fishing experts. Instead, encouraging foreign fishing vessels in deep sea fishing sector is not advisable and will adversely affect the livelihood of the Indian fishermen and also will hamper the sustainability of the Indian fishing industry. Many foreign fishing vessels are illegally engaged in fishing in Indian waters. The fishing methods adopted by them are destructive and will, in the long run, leave our seas barren. They are insensitive to the need for sustainability of the fishing industry and are irresponsibly looting our marine potential. This will not only deprive the fishermen of their livelihood, but also have its impact on the national economy in the long run. A scheme called the “deferred payment scheme” has been introduced in the guise of helping the industry to increase the Indian Capacity for Deep Sea Fishing Operations. We feel that this scheme will only help the collapse of Indian fishing Industry, especially the Tuna Industry. Many foreign fishing vessels operate illegally in India with duel registration. Foreign fishing vessel owners are registering their vessels in India as Indian fishing vessels on the basis of letter of permit (LOP) under deferred payment scheme, with the support of their Indian counterparts. But they maintain their original registration abroad in their country. This duel registration is maintained for fishing in the Indian EEZ as Indian fishing vessels and later, they do the high sea transshipments of the fish caught for being sold in the Japanese Market as fish caught in joint venture with Indian Companies, thereby legalizing the Tuna fish export. It is worth to note that the high sea transshipments of the fish will not be accounted as exports from India and in future when the quota system is implemented, Indian fishing industry will not get the required quota owing to this reason. The vessels under LOP should register with Indian Ocean Tuna Commission (IOTC) for fishing in international waters. But they are freely fishing with out the registration IOTC. Another irregularity is that some foreign fishing vessels fly Indian National flags when they are Indian EEZ and when they crossed the limit they fly their own countries flags. To be honest, we are being fooled. It is also worth to note that the crew members of the vessels are foreigners entering in India with out proper documents and Employment VISA. This can in no case be encouraged in the interests of national security. Under the disguise foreign crew members, terrorists can enter in to our nation by sea route as have happened in Mumbai. Not allowing the fishermen to enter into sea by creating separate areas like “Special Economic Zone”, “Special Tourism Zone”, “Marine Protected Area” etc, but allowing free passage in these areas to foreign fishing vessels can not be justified on any grounds. It goes against not only the self respect of Indian fishermen, but also is unconstitutional and against the principles of sovereignty of a Democratic country like India. Recently many fishermen from Kanyakumari were arrested and detained with their fishing boats in the name of security check though they carried genuine documents. This was done as a part of security check because of the recent terrorists attack in Mumbai. We strongly protest this illegal detention and prolonged court trails, which was done irrespective of the facts that the fishermen were carrying documents to prove their identity. We sincerely hope you would consider the above facts from the fishermen points view. We request you to give necessary direction to the concerned ministries and officials for taking immediate action to resolve the issues. Today, there have been 11 visitors (32 hits) on this page!